Filed to: Snow!Filed to: Snow! Dreaming of a white Christmas? 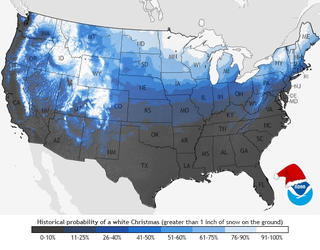 NOAA released a graphic that charts out the probability that you’ll have some snow on December 25th, based on historical norms. I don’t know about you, but looking at my Facebook ‘Memories’ feature, and I’m seeing that on this date over the last couple of years, we’ve had snow on the ground, a lot of it. I’m holding out hope that we’ll get some before too long. This map is based on the 1981–2010 Climate Normals, which are the latest three-decade averages of several climatological measurements. This dataset contains daily and monthly Normals of temperature, precipitation, snowfall, heating and cooling degree days, frost/freeze dates, and growing degree days calculated from observations at approximately 9,800 stations operated by NOAA’s National Weather Service.